iOpt has developed a unique service that allows managers of large property portfolios such as social housing to monitor stock that is otherwise difficult to access on a regular basis. This happens in near real time to predict and monitor potential damage to the property or environmental risks to the tenants health. 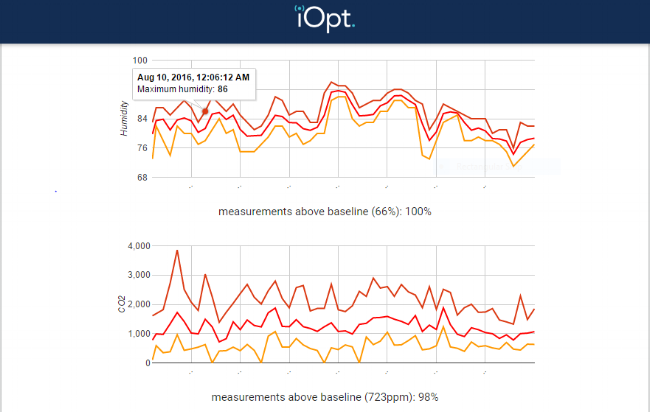 iOpt sensors monitor the environment within your assets. Normally there are 3-4 sensors per 2/3 bed property. The sensors send their data to iOpt where we analyse it utilising the latest data analytics and machine learning techniques. With the alert will come a link that will take you directly to the asset page allowing you to study the data in detail and download it if required. From here you can decide what to do, when to do it and justify why you are doing it, all whilst efficiently deploying limited resources and saving money. The example below was a property that showed extremely high humidity levels due to tenant lifestyle. An alert was generated, the asset manager acted and the resulting estimated cost savings were approximately £4,000 over the following 24 months.... or 8 x ROI. Find out how iOpt can help you protect your assets and prevent damage.